New models of refrigerators released in 2017 by Godrej comes with Cool Shower technology. Herein shelves come with air vents smartly placed above the food to ensure optimal cooling. Cool Shower technology ensures uniform cooling throughout the refrigerator. Air release through these vents is circulated in multiple directions so that every part of the refrigerator is cooled evenly. Generally, ordinary refrigerators come with a single fan which takes the burden of cooling both—refrigerator and freezer. But Godrej’s flagship NXW series premium refrigerators come with a Dual Fan system which enables independent cooling of the refrigerator and freezer compartments. Using two separate fans, it effectively circulates the cold air throughout the refrigerator. Single door Edge series comes with a Turbo Chill mode which when enabled, quickly chills the stored item inside the refrigerator. This feature would be a boon for the users who need to serve guests usually coming on a short notice. Godrej believes Turbo Chill empowers the refrigerator to deliver 50% faster cooling than the conventional direct cool refrigerators. True that different zones help to maintain a different set of temperature for optimal cooling but what if you keep regularly opening the fridge intermittently? Will the surrounding heat disturb the balanced temperature inside? No. Thanks to its smart air lock system which deftly minimizes the cooling loss even if the door is being open intermittently. 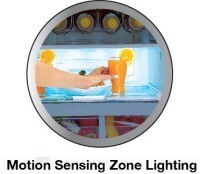 Modern Godrej refrigerators come with bright yet efficient LED lighting inside the refrigerator. This new LED lighting which is not only slimmer but also softer and much more energy efficient. This LED lighting system emits much lesser heat than the ordinary bulbs. So, the food would inside the refrigerator remains much more immune to temperature swings owing to the lighting arrangement. The usage of LED bulbs not only leads to significant reduction in power consumption but are also known to have a much longer serviceable life. The flagship NXW series comes with innovative motion sensing lights that can detect any movement. 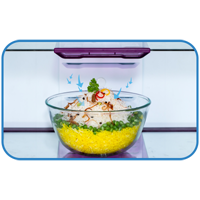 Based upon on the detected action, it illuminates the area where the user is looking for food or trying to arrange the food items. Eon series of Godrej refrigerators come with large vegetable tray wherein you stuff your fruits and veggies as heavy as 34 Kgs. While the high-end NXW series comes with innovative flexi freeze tray which can extend vertically easing the space management inside the refrigerator. They also come with detachable storing trays which can be even used as serving trays. Similarly, there are removable bins in the door to store items like dry fruits, chocolates etc. Twist and serve ice tray lets the user easily procure ice simply by twisting the knob. Modern double door refrigerators come with unique polybag suspender with hooks to conveniently hang frozen food items. Keeping bottles inside the poorly designed refrigerator can be tricky. But astutely designed modern Godrej refrigerators don’t pose that challenge. New models from the Edge series comes with deep bottom chiller compartment capable of holding 5 bottles of one liter each. If you want to store larger bottles, then there is bottle shelf with metal retainer capable of holding bottles as large as 2.5 liters. Premium models from NXW series come with smart collapsible wine rack capable of holding 5 bottles. Agree, Godrej offers lots of space and customization options using variegated trays, shelves, and racks but are they durable? Well, the answer is yes; thanks to the usage of toughened glass. Toughened glass shelves are capable of bearing extra load without breakdown. This toughened glass shelf comes with a solid border that prevents seeping of liquid from the shelf in case of a liquid spill. Taking cues from Samsung, Godrej too uses Silver Ion technology in its refrigerators. Modern Godrej refrigerators come with silver nano coating to exterminate bacteria and fungus. When the circulated cool air inside the refrigerator comes in contact with silver ions, respiration system of the bacteria is choked. Thus, silver ions kill the bacteria and inhibit further cell growth of bacteria. The gasket of modern Godrej refrigerators comes with Anti-B technology which preserves the hygiene of the stored food by decimating the dwelling bacteria. It is removable too; meaning users can easily clean it if the need arises. Thus, the gasket seals the freshness by prohibiting the entrance and accumulation of bacteria, that could blight the stored food inside the refrigerator. Due to tropical nature of Indian climate, rusting of the refrigerator is a major concern for the Indian consumers. Factors like salinity, industrial pollution, and temperature variation further aggravate rusting predicament. Now, the chances of food contamination increase due to corrosion. So, to savage refrigerators from rust and food from contamination Godrej has come up with Zinc Oxide Protection (ZOP) technology. Refrigerators protected with ZOP technology are made of 100% galvanized steel as opposed to cold rolled steel. Besides the protection from rusting, usage of galvanized steel increases the life expectancy even in the severe urban environment. Modern Godrej refrigerators come with intelligent automated defrosting which considers important parameters like previous defrost time, ambient temperature, the frequency of door opening, frost accumulation etc. This ensures optimal defrosting. If a user wants to override this inbuilt automation and wants to further customize his refrigerator then NXW series offer digital touch control panel which is mounted on the front. This touch panel display allows the user to customize the temperature for each shelf, change modes, etc without needing to open the door. There is an Intelligent mode, which when enabled, brings down the refrigerator temperature by 2oC before defrosting in order to avoid potential thermal shock which occurs due to defrosting. Power cuts and load shedding is commonplace in India, especially in distant towns and villages. Since refrigeration generally works 24×7, it is a home appliance most susceptible to the erratic blackouts. Power cuts poise two problems for the refrigerator. First is the spoilage of food in case if power cuts persist for a longer duration of time. Second is much more hazardous—damage to the refrigerator due to voltage fluctuations. Godrej’s new refrigerators are well-equipped to handle this crisis. It comes with a good cooling retention plan, courtesy—StayCool technology. Refrigerator with StayCool technology comes with a cooling gel located in the freezer on both sides. This cooling gel keeps the food well frozen for few hours without power, and keep the freezer compartment cold even in the absence of electricity. This means even ice cream kept inside the refrigerator won’t melt for few hours in case of blackouts. Another problem with power cut is discharge and mixing of a foul odor inside the refrigerator. The latest line up of Godrej refrigerators comes with unique Carbon Palladium deodorizer that filters out foul odor and removes ethylene trapped in the refrigerator emitted from rancid food items. Thus, StayCool ensures food remains chilled for several hours during blackouts, while the deodorizer represses the fetidity of rotten food. Being the oldest refrigerator company in India, Godrej offers good quality of refrigerators. Just like other brands, it has its own hits and misses. One of the biggest miss from Godrej is the unavailability of premium French or multi-door refrigerators which all other big brands offer. Though they have embarked on premium refrigerator segment by launching NXW series it needs to bring French door models to cater high-end customers. The inbuilt water dispenser is something we missed with Godrej refrigerators as well. Though many of the new models come with the stabilizer-free operation, minimum starting voltage of 140V is much less compared to other brands like Whirlpool, LG, and Samsung. Godrej is one of the dominant players when it comes to single door refrigerators. Thanks to its Cool Shower technology which imparts thorough and uniform cooling throughout the refrigerator. While usage of good insulation material and air lock system ensures that the ambient heat does not creep inside the refrigerator. Godrej refrigerators are least prone to corrosion, thanks to its heavy investment in the usage of ZOP technology. Consumers dwelling in the area where power cuts are common, can feel safe after buying Godrej refrigerator for it comes with a solid power-cut backup plan in the form of StayCool technology, aroma lock, and stabilizer free operation. So, if you are someone who is looking for an Indian brand of refrigerator and have a tight budget but want a refrigerator made up with good quality parts designed to last long and survive the vagaries of power cuts, you can consider Godrej.